The sentiments in the Merry Christmas Thinlits Dies are so versatile. You can cut out colored cardstock, foil paper, Designer Series Paper or Glimmer Paper to get different looks. 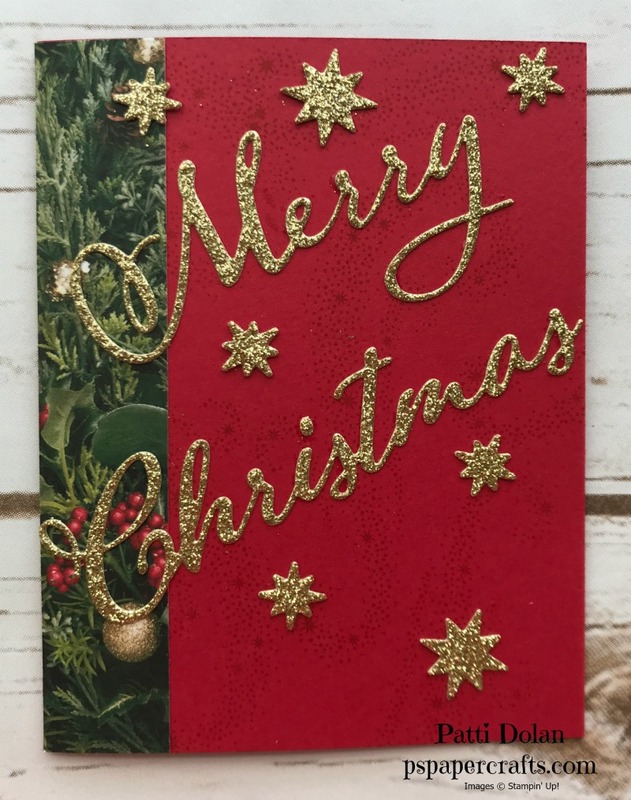 I used the Gold Glimmer Paper on this card. Don’t you love the sparkle!!! I stamped a random pattern using the star “swoosh” (is that what you call it?) from the Star of Light Stamp Set in Cherry Cobbler Ink on a Cherry Cobbler card base to add some interest. The border is a strip of All Is Bright DSP. The stars are cut out of the Glimmer Paper using the Thinlits from the Start of Light Bundle. I adhered them with some Mini Glue Dots. On the inside, I used that beautiful sentiment with a little flourish.